Fabricated of alloy 18-8 stainless steel, type 304. Tubing is 18 gauge, 1″ OD (Ø25) with a No 4 satin finish. Length suitable for a 60″ wide enclosure either on opposite walls or across the face opening depending upon rod length chosen. Flanges are fabricated of heavy-duty rust proof Zamak 3 with a Chrome finish. Flanges include two (2) countersunk 15/64″ diameter (Ø6) holes to accept No 10 (M5) flat or oval head screws (by others). 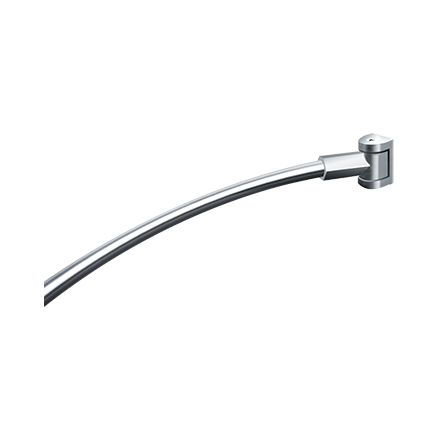 Outwards bow of installed curved rod provides additional 8-1/4″ (210) of shoulder room at mid-point of enclosure beyond what a similarly placed straight rod affords. A complete instruction manual is provided with each unit.